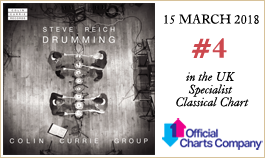 Steve Reich's seminal work receives an enthralling, definitive, recording from performers steeped in its wonderfully unclassifiable heartbeat. 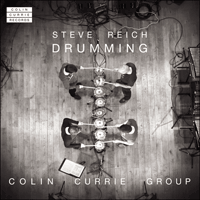 When the BBC Proms asked me to curate a concert to celebrate Steve Reich’s 70th birthday in 2006, I turned immediately to Drumming. A central pillar of his substantial output, the work is a thrillingly unclassifiable musical colossus, presenting robustly avant-garde attributes and positively teeming with energy. To date, it remains his longest work. Based on a single twelve-note pattern, the work is in four parts, which all use the composer’s trademark 'phasing' technique to the fore of the musical development. In this process, musicians using identical timbres face off against each other, with one musician selected to accelerate their pattern until a new 'resulting pattern' is established, thus considerably enriching the counterpoint and texture of the music. When this happens repeatedly, and with numerous percussionists, the overall effect can be extremely fulsome indeed. To highlight these patterns further, the composer deploys women’s voices to interact with the sonority of multiple marimbas, then whistling and piccolo to reach the higher-pitched massed glockenspiels. Some flexibility is afforded the musicians in this process, whereby the number of repetitions involved is subject to change and indeed the selection and ordering of the patterns to be highlighted. As such, the work lives and breathes an extraordinary flexibility and suppleness in performance that is very much part of its unique allure. Arguably, the work is also a line in the sand for the composer. 'Phasing' was in fact phased out after this composition, as if a particular musical process ultimately had been solved and sorted. In Part Four of the work, we hear his first ever use of a mixed-timbre ensemble, which he achieved by having all instrumental groups play together, thereby giving us a delectable foretaste of some of his colouristic combinations to come. Drumming also exhibits his first use of building patterns by substituting rests for beats (a process that is also used in reverse, by substituting beats with rests). The joy in our continued performances of the music live in concert is in unearthing anew every nuance and acoustic subtlety available to the listener. It became important to the group to record the work as a document of where these musical inquiries have taken us, and what this adventure has brought out of the notes on the page. Performing the piece is continually fascinating: years of experience playing it in a wide variety of venues and spaces has presented us with multifaceted insights into what the music can offer. This is also the work that brought this ensemble and the composer together in person for the first time (in London in February 2010), and we are proud of our continued collaboration with Steve, which has resulted in many live performances together and the commissioning of new music for the group. I hope you enjoy this wildly brilliant work, in all its excitement, delicacy, audacity, and power.